For over thirty years EVA has been the “State of the Art” cushioning material in the footwear industry. Reach out and we will walk you through the features of this incredible material. Here is just one example of why RMAT is so much better. 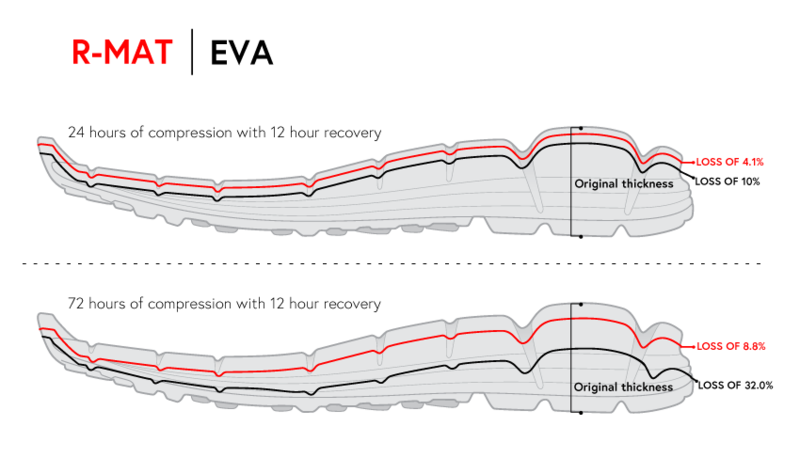 RMAT is a unique formula for midsoles, outsoles and ground contact foams. In comparison to competing footwear components, RMAT has superior durability, cushioning, and traction; the result is an incredible ride on multiple surfaces..
RMAT consistently scores above EVA on abrasion resistance, static & kinetic coefficients of friction, and compression sets. Some of the qualities are even better than rubber, without the weight. RMAT was created by footwear industry veterans who recognized a need for a better foam material. After years of R&D we came up with something amazing and have sold over 20 million pairs in the last four years.